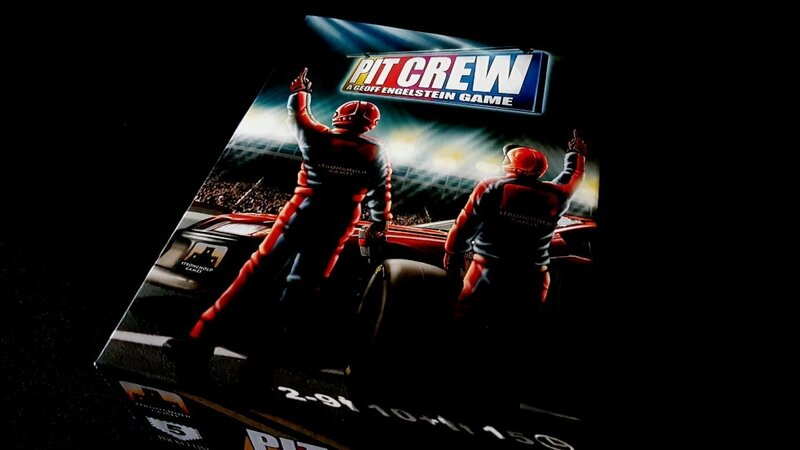 Pit Crew is a game characterised by a lovely design let down by poor components – that’s not enough to sink it below the three and a half stars we gave it in our review but that rating could have feasibly have gone higher with only a little more generosity shown in the box. Normally component issues are addressed here rather than in the review itself, but they’re significant enough in this case to uncomfortably straddle both posts. You never know though – perhaps it’ll all work out in the end. There’s only one way to find out – let’s strip this thing down to its nuts and bolts like the expert Pit Crew we have no chance of being. It’s pretty remarkable in a game that has only three colours that they still aren’t chosen from an accessible palette. This doesn’t necessarily have a major game impact, but it remains frustrating to see this problem manifest again and again even in 2017. Who’s in front. What’s in second place. I don’t know is in third. Protanopes are the ones that are most likely to suffer here, although those with Deuteranopia will be also be somewhat at the mercy of lighting conditions to make out game and race state. To be fair, all these cars do is indicate where someone is in terms of laps and score track. They could be substituted for pretty much anything else and they’d do the same job. It’s just – I mean, come on. 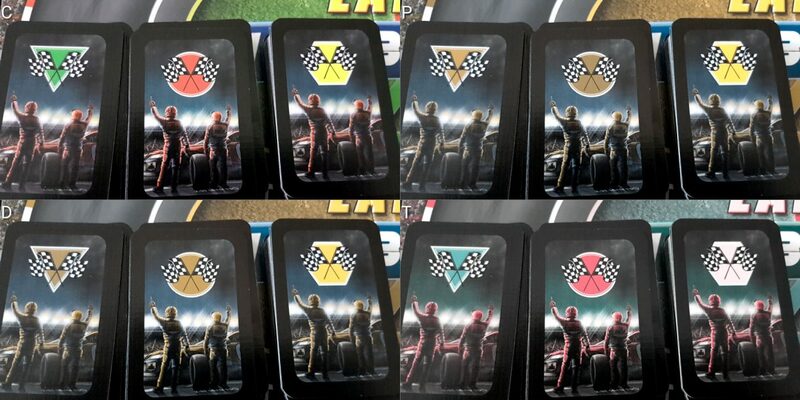 For the cards, these are held by a single pit crew and there’s no ‘cross contamination’ of the colours. The only time that colours might become an issue in this case is during setup and teardown, but in any case each colour has a different symbol to go with it so it doesn’t cause a problem. We’ll recommend Pit Crew in this category since you can easily swap out whatever car is likely to cause a problem (assuming any will) but it remains disappointing to see this in such a recent game. There is a common theme that will appear in this teardown, and it is real time. Real time games, by their very nature, tend towards inaccessibility because accessibility compensations take time. Here, you’re dealing with tiny cards being placed in sequences that are distributed in five or six places on a thin cardboard mat. If you’re on a team that has more than one person, the state of the car will change from second to second without your involvement – clear communication there will be invaluable, but it’s no substitute for visual analysis of game state. The cards are reasonably well contrasted, but while the black numbers have a white outline they’re not necessarily clearly discernible against the dark grey of the background in all circumstances. Letterboxing would have been much more appropriate here although it’s not likely to be a critical problem for those with minor to moderate visual impairments. The numbers are quite large, but the problem is they’re large in relation to what are tiny cards. Due to the nature of play, visual accessibility will trend towards poor because you don’t have a lot of time to be neat in how you play things down. Straightening cards and ensuring they can be seen by each player is a time burden that eats into competitiveness. A fully sighted player will be able to pick up on ambiguity but it’s going to be more difficulty for players with visual impairments to get a sense of the game as it is evolving. That’s even with leaving aside the difficulty of knowing how much time you have in relation to other players since their work is at a distance and unlikely to yield itself to casual inspection. It’s not appropriate to rely on asking people either – they’ve got their own problems to contend with. There is, I suspect, a playable game in here for a visually impaired player – at least one that can make out their cards – in simply providing numbers when necessary as part of a multi-player crew. ‘I need a black three’ or ‘I need a four or a six’. That would permit a player to focus on the two or three cards that make up their hand. The problem is that I don’t see that being at all fun – essentially you’re a semi-autonomous card holder for other players. 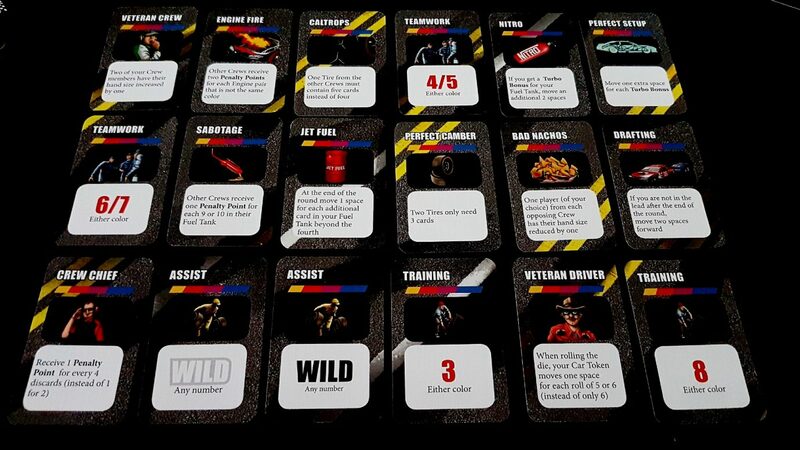 The fun in Pit Crew lies in working together to optimally distribute cards, and everyone has to have a role in that if the game is to be satisfying. 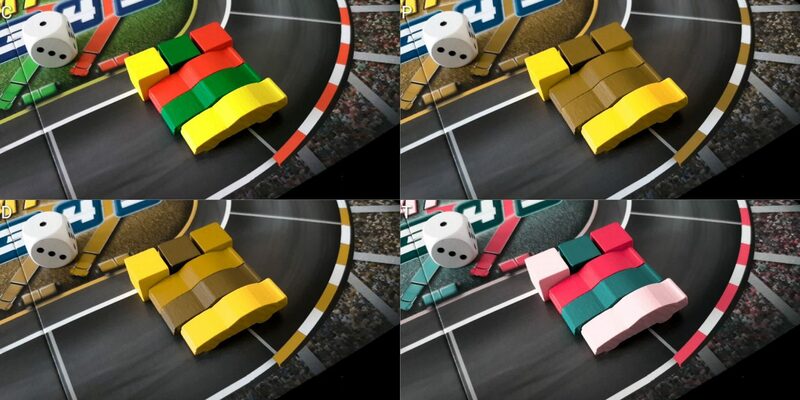 The scoring structure does at least lend a little tactility to working out who is winning and who isn’t – you can tell by touch where cars are, but not what colour they are. That’s information easily represented verbally, but in that case the tactility doesn’t actually offer an independent route to information. 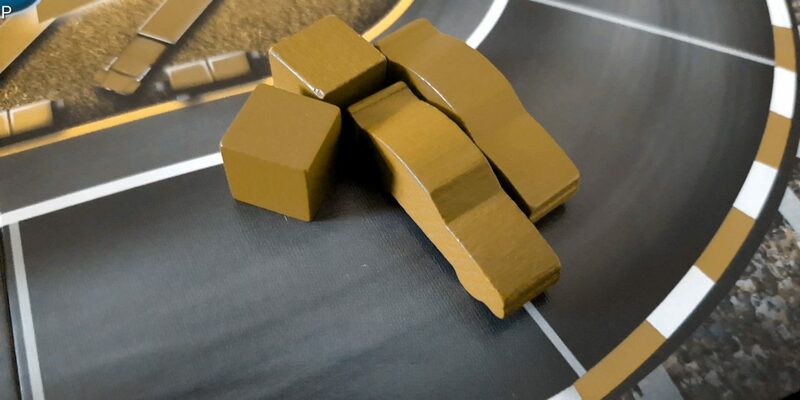 I mention this though because you could substitute accessible tokens for the cars and lap markers to modify at least this part into tactile accessibility. If this were a turn based game, I might be inclined to offer it a tentative recommendation. It’s real time though and your time limit is set by the competence of other people around the table. That means we recommend players with visual accessibility considerations avoid Pit Crew. Pit Crew requires numeracy, and numeracy at speed. The sophistication expected of this is not high – counting and addition is where it tops out. Added to this though is a considerable degree of implicit understanding of probability, and even a degree of implicit symbolic understanding. You need a card that is X, and X might be one of several possibilities. The value of X in the context of Y might be greater than in the context of Z, so you’re choosing between several valid possibilities of placement with an eye to what’s going to come out of the deck later. If you’ve spent all your twos already, then placing a three on a tyre is half as useful as it otherwise would be. The game complexity trends upwards, but not especially sharply. Every new round monkey wrench cards will be dealt out, but you could omit this if you wanted to moderate the cognitive cost. Each new car that you work with has a successively higher fuel tank value, and an increasingly complex engine requirement. Neither of those have a major impact if the cognitive requirements of dealing with the first car are not too high to be reasonably met. In any case you could play all three rounds with the starting car if the more difficult vehicles were going to be a problem for anyone at the table. If playing team mode, there’s some scope for team-mates doing the heavy lifting of the work. As with the section on visual accessibility there are serious question marks over how much fun it is to just be a holder for someone else’s cards. The time limit, and the nature of the game, doesn’t lend itself to subdivision or specialisation of efforts. You can’t have someone who is just handling the fuel because they’ll need cards from everyone else’s hand. The cards in their hands likewise will be needed for other parts of the car. As such, while someone could be relegated to providing cards when needed it’s unlikely to be satisfying for them. There is an optional variant in the rules called the ‘Handicap game’. I assume this means in terms of a handicap in golf, but its usage here is a little unfortunate in terms of the language. Anyway, it offers an opportunity for the more experienced team to use the three most difficult cars while the less experienced team uses the three least difficult. This doesn’t have a major impact on game difficulty though, and while it offers a degree of balancing it’s the real time aspect of the numeracy that’s most likely to be a problem. You could get a more significant rebalancing though if you stuck to a single car and had one team with the easiest and one with the most difficult. Unfortunately this is an imprecise tool for balancing the game around cognitive accessibility needs. Real time games, as part of their fun, introduce an element of stress and tension into play – stress can have an across-the-board impact on cognitive faculties and if this is already a potential problem area it would be a significant consideration. You could play this turn based, but I think it would then be a game that ceased to meaningfully function in any real capacity. For those with memory impairments only, remembering deck composition is the key cost to play. You need to be aware of what’s been discarded, what’s been used, and what’s left to draw. The latter is going to be hidden from everyone, but it’s possible to have a fair idea of what’s available if you’re tracking play carefully, or even semi-carefully. Discards and played cards are open knowledge, but that’s only valuable if the information can be related to the cards left to be drawn in the draw deck. The question then has to be ‘to what degree is numeracy at speed and under stress likely to be an issue?’. Some cognitive impairments will be hugely impactful here, others less so. We don’t recommend Pit Crew in the fluid intelligence category, but we tentatively recommend it in the memory category. It’s not an ideal choice to play if someone may find it difficult to track the composition of the draw deck, but to be honest most people will be too busy with the job in front of them to pay much attention in any case. 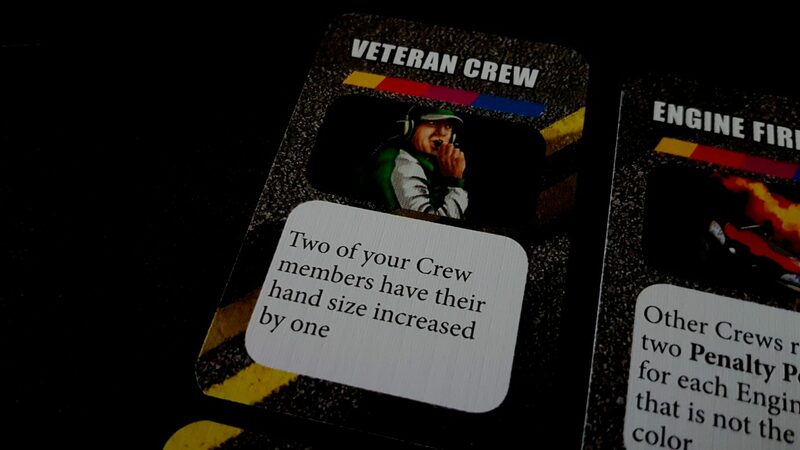 You have a maximum hand limit of six, and in a team based crew you’ll only have three or two cards to hold at a time. However, given the real time nature of the game and the constant churn of cards a holder will do little more than add an accessibility tax onto every action you perform. If physical impairments impact on the ability of someone to hold and play a hand of cards, I’d say Pit Crew is going to be at best a troublesome proposition. It’s made even more so by the ridiculously small cards with which you’ll be working – the size, and poor quality of the card stock, adds a physical inaccessibility to every player regardless of impairment. The nature of the game makes verbalisation functionally impossible without very significant game impact. There are two possibilities here. You’re in a team by yourself and won’t be able to rely on a player in another team to enact a request since they’re a) your opposition, b) having to respond in real time, and c) caught up in their own problems. If you have someone else on your team then all you end up doing is slowing them down – they have to do most of the physical work themselves but now across two hands of cards and with an additional requirement of verbal coordination. The only workable scenario here would be a player with a dedicated helper able to act on their behalf while not being responsible for any part of the game state. Even in that case, the additional burden of verbalisation would add a time lag to every action. We don’t recommend Pit Crew in this category. Real time games add stresses, and real-time games where your time limit is set by the activity of the table intensify that. You have as much time as your opponents give you, and in this case it’s a bit like watching someone walking early out of an exam. You might think they either did really badly and gave up, or did really well because the exam was easier than you found it to be. In either case, it has an impact on your state of mind approaching the rest of the paper. The dice rolling that indicates one or more teams have finished before you have piles on a considerable amount of additional pressure that can create the perfect circumstance for a series of unforced errors. It adds a push to get things finished, and not necessarily finished correctly. This is an important, and even enjoyable, part of what makes Pit Crew an effective game – it’s just something that can be a trigger in this category. When you make mistakes, you benefit your opponents. That’s mostly fine since all things being equal their mistakes will equal yours. There’s a really interesting talk by the designer on the psychology at play here and it’s worth checking out. There’s a kind of failure cascade built into the game though in that when things are going badly and you’re behind the tempo of the other teams you might end up discarding more cards than you realise. That’s especially true across a two or three person team. The result is that you end up accruing penalty points at a punitive rate just because the card draws didn’t favour you. Discarding cards isn’t a one and done process – it has an impact on how valuable all the other cards to follow will be. If you don’t have a card that can continue a tyre, or your only engine cards would lose you a turbo boost, you might want to try a discard and draw for better luck. That tends to create a cycle of discarding that only becomes evident when it’s too late – when you’ve discarded those cards that cool contemplation would have told you to keep. You rarely end up in a circumstance where you can’t play a card, at least not until you’ve gone through too much of the deck to recover, but you’re often left with a circumstance where your only options are bad. It’s never great to be faced with a choice when every single option is an act of self-sabotage. We’ll tentatively recommend Pit Crew in this category. That real time element can be brutal if people aren’t in the right mind-set for it or if they may have emotional control conditions that do not thrive under stressful and competitive circumstances. In a single player team all you need to be able to do is indicate when you’re done – that way if someone is rolling an early advantage die they know they have to stop. For teams that involve multiple people though there’s a lot of communication, often requiring very quick and very precise agreement on how cards are going to be allocated. That is unless you just play in silence, not co-ordinating activities. That’s possible too, but isn’t likely to lend itself to winning strategies. 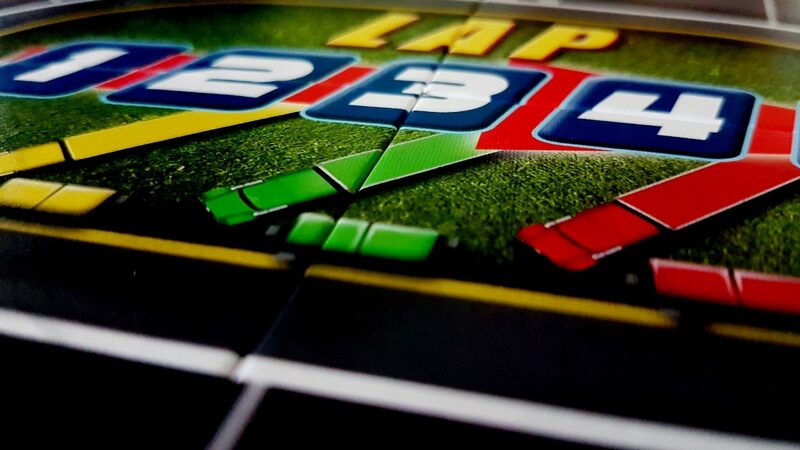 Mrs Meeple will attest to that since I play Pit Crew like I’m Sir Humphrey Appleby – I won’t reveal any information unless it’s cajoled out of me. A secondary issue here is that the other team will also be excitedly discussing their own plans, and it might be difficult to make yourself heard, or hear what other people have to say, over a low-grade hubbub of activity. You can’t take turns speaking since the game is in real time. Any time you need to ask another player to repeat themselves is a few precious seconds of compensation that another team can utilise to their advantage. A small degree of literacy is required too when it comes to understanding the effect of the monkey wrench cards, but with familiarity this will become less important. Our recommendation here is going to be tentative, dependant on play mode. If you play this as a one person team it will be fine. As a two or more person team, we’d be inclined to recommend you avoid it. As such, we’ll average it out and say ‘Well, maybe – it depends’. Most of the game art has characters hidden behind padding and helmets, and that offers a degree of ambiguity in representation. Who knows what they’ve got underneath those garments? The Monkey Wrench cards tell a less inclusive story, with plenty of men but no women represented. More than that, they’re all white men. In this respect, Pit Crew is a little less inclusive in its policy on driving than Saudi Arabia. NASCAR may not have a stellar reputation in this regard, but they do have women pit crew members. Formula One may also be terrible with regards to women drivers, but they do exist even if they often don’t compete in high profile races. Theme is rarely an excuse for poor representation. We only occasionally accept it as a valid consideration. While Pit Crew does reflect the real-life gender divide of the sport it has counterexamples to draw from. A game, with no sociological inertia to hold it back, should be ahead of the curve. Pit Crew feels like a cheap game, because Stronghold Games have noticeably skimped on the components. Everything about it feels like it was produced as a cost-cutting exercise, and this has an impact on its playability as we discuss in the review. However the game does reflect that in the price – it has an RRP of around £24 and it plays as many as nine people. It gets better as more people are involved too so it does offer a pretty excellent ratio in terms of ‘pounds to players’. We’ll recommend Pit Crew in this category, but it really should do better in both representation and the quality of its components. Mmm, we don’t have a lot of positivity here and that means the issues of intersectionality resolve themselves as a function of individual categories. There’s no combination of categories here where one contributing impairment wouldn’t already result in us withholding a recommendation. It’s easiest to just think ‘Whatever the combination, it makes everything worse’. The real-time aspects are responsible for that more than anything else. Pit Crew plays reasonably quickly, although that’s going to depend on the accessibility profiles of everyone at the table. It plays as quickly as the fastest team, and that adds a number of very significant accessibility issues across the board. It doubles down on stress, multiplies the intensity of the experience, and has the potential to trigger discomfort as well as simply exacerbate it. Given how the game is played over several rounds there are natural bail out points, and as such if it does become too much for anyone at the table it’s possible to reset for smaller player counts as the game goes on. It really is tremendously flexible with player counts. Unusually too, this is a game that can be team based but manages to take all the accessibility gains that comes from that and completely jettison them. Team based games, even with competitive elements, tend to be more accessible because another player is directly invested in the success of their colleagues. Team based games usually permit distribution of responsibilities that can play to everyone’s strengths. Here everyone has to do everything and be on top of all parts of the job. Nobody can specialise, and that’s a shame because collaborative games usually shine in this area. Real time games don’t get much love in our accessibility teardown, and that’s because accessibility compensations take time. As soon as you add a time limit on to anyone’s activity within a game you vastly raise the barrier to participation. So it is with Pit Crew. However, Pit Crew also doesn’t do itself any favours in some of these categories. It could have had better, higher quality cards – that would have helped with visual and physical accessibility. It could have made an effort to be more diverse in its representations than the vague stereotypes it employs on the monkey wrench cards. It could be designed around a system that permits for greater subdivision of responsibilities, enabling players to focus on jobs that work best with their accessibility needs. As it is, all that team based play does is add an additional burden on to everything everyone has to do. 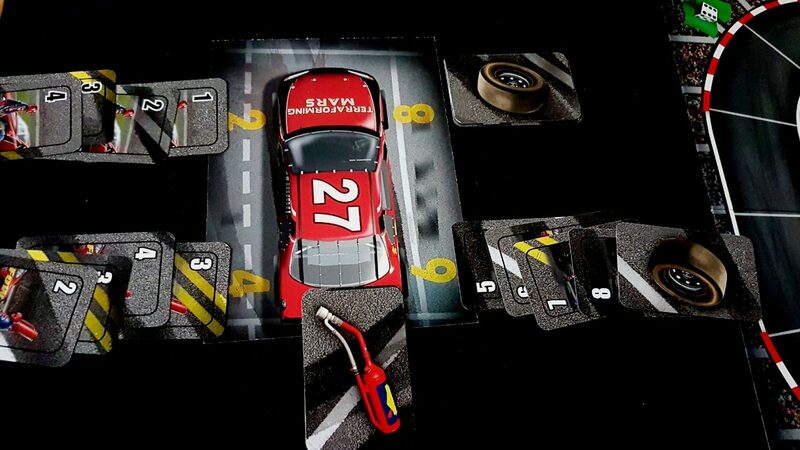 I think Pit Crew, with a revised second edition that offered higher quality components, would merit more than the three and a half stars we gave it in our review. There’s a genuinely great game in here that is let down by its slip-shod production values. It could be meaningfully more accessible than it is. Should such a version of the game eventually materialise I’ll certainly be happy to revisit this teardown in a somewhat optimistic frame of mind. For now though – best be wary.